Pink Lemonade: Fat Quarter Face-Off Pink Lemonade Style! The trinket basket idea can be found all over the internet. I read through so many great tutorials on how each person makes theirs but found each to be slightly lacking what I would do! So I decided to do up my own tutorial for you with all the little tips n tricks I use when making these oh so simple baskets! 2 coordinating fabrics, cut to 11" squares - The beauty of using a fat quarter bundle is that they all coordinate. 1 - 11" square of low loft batting - I used a scrap of Americal Spirit Classic Cotton Batting that I had on hand. 8 -6" ribbon pieces - I used a simple grosgrain, but you could go as fancy as you like. 3. Repeat ribbon placement for all four corners of the project. 4. Place the second 11" square of fabric face down onto the ribbon bedecked square. Pin in place. I usually pin right through each ribbon to ensure the ribbon stays in place and then just between the pins at both the corners and the centers. 5. Stitch 1/2" from the edges all the way around the piece, making sure you leave a 3" -4" opening so you can easily turn out the project. QUICK TIP: Note my opening is between a green and a red pin? I always use a green pin at the beginning of where I start sewing and have a red one where I should stop. This way I don't have to be worried about sewing my project fully shut - and believe me, that has happened!!! Now however, I have a visual reminder - Green for Go, Red for Stop! 6. Clip each corner off as close to the stitching as possible without clipping the stitching. 7. Turn the project out using the opening you left when stitching all the way around. 8. Use a corner tool to really get those corners turned out nice and crisp. I just used the stuffing stick that comes in the Poly-Fil Bags. But you could use a crochet hook, chop stick, pointed pen with cap, etc. 9. Use your fingers to "finger press" all the way around the edges. Make sure to pull the excess fabric away from the seams to make this as polished as possible. 10. Use an iron to now fully press the entire project, paying special attention to the edges. 11. Top stitch a scant 1/4" from the edge, all the way around. 12. Tie the ribbons each corner to create the basket and you are done! Here I have option 1 - Fill the basket with a package of homemade fudge, cookies and candies to give to your friends and neighbors. Option 2 showcases that this basket is REVERSIBLE!!! Fill with candy and use as a festive holiday candy dish. Option 3 shows the use of two different fabrics. I timed myself on this second one so I could tell you that it actually took under 20 minutes start to finish! :D And as you can see, here I have it holding napkins. I also turned down each corner to give it a different look. I hope you have enjoyed my project and tutorial...now remember that contest you and I can both win?? How can you win the giveaway? Leave a comment telling us what you would make if you won. We will randomly select TWO winners; TWO people who comment on the Fairfield Blog, to win a Fat Quarter Bundle and choice of a bag of Poly-fil batting or Poly-fil Fiberfill. Not only could you win something but you can help me win too. We Master Makers are competeing for prizes!!! 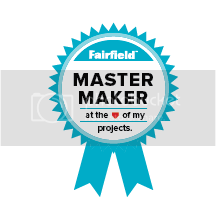 The winning Master Maker will get a $75 Amazon card, Second Place $50 Amazon card and Third Place $25 Amazon card. So if you vote for your two favorite projects you could be helping both you and I win this contest!!! :D So GO VOTE!!!! !